The last of the Hammer Frankenstein films, this one deals with the Baron (Peter Cushing) hiding out in an insane asylum, so that he may continue his experiments with reanimating the dead, along with inmate Dr. Helder (Shane Briant), who has been institutionalized for conducting similar experiments. Also stars Madeline Smith. 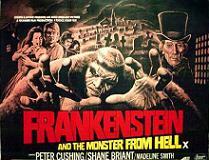 Also with Dave Prowse (As the monster) and Bernard Lee (Best remembered as the original "M" in the James Bond films). This rare import print is the longest version of this film to date. It includes the full "artery clamp" scene missing from all other releases.